Last week we entered the beginning of an exciting season. Our audio world is beginning to change, and we’re all pretty ecstatic about what’s going on. First a little history. Some of this might be old news to folks who’ve been reading the blog for a while, but I want to make sure I haven’t missed anything over the last couple years. On my campus, we have two large auditoriums (2500-3000 seats in each room give or take). The East Auditorium was the first auditorium built for the campus, and the West Auditorium was added on later due to rapid growth in attendance. When I came on staff in September of ’06, they had just switched out a Soundcraft Series 5 for the Digidesign Venue in the East Auditorium. I had a year of working on the Venue under my belt in Chicago, but the console had maybe been installed for a month so it was relatively new to everyone. Meanwhile, a second Series 5 still resided in our West Auditorium. While some might enjoy the idea of having two different sets of gear to work with for variety’s sake, this has actually been a challenge for us because our FOH engineers traditionally rotated between auditoriums. If you figure an average of three weeks between serving, each of our engineers could go at least 6 weeks between touching either console as they rotated between auditoriums. There were a few different things I noticed from this, but the big thing was our guys weren’t learning the new console as quickly as they should have been. It took us a while, but the best solution we could find for this was to split our FOH engineers into specific auditoriums where they could master one set of equipment, and that’s how we’ve been functioning for quite a while now. So the thing that has us all excited is last week marked the beginning of the end of our two worlds of audio as we received our new Digidesign Venue which will be replacing our West Auditorium Series 5. The console arrived last Tuesday, and most of Wednesday was spent getting everything put together. We had additional input and output cards to install in the stage racks along with expansion cards that needed to go in the FOH rack. There were plugins to be installed and console software that needed updating. And then I spent some time testing as much as I could in the FOH rack. In addition, there was some shuffling of input and output cards we needed to do on our current Venue to get things to match as closely as possible between the auditoriums. 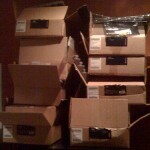 Despite the fact that the console has arrived, we are still about a month out from installing it at FOH in the West. I would love to see it out there sooner, but this is part of a larger overall strategy that began at Christmas when we began the process of getting our monitor consoles repaired and refurbished; those consoles are about ten years old and simply need a bit of TLC at this point from some qualified techs. So here’s our current timeline. 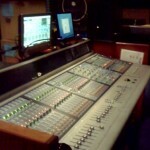 Next week we ship our West Monitor console to Nashville for repairs. The current East monitor console will then be moved to the West, and the new Venue will be installed in monitor world in the East to be used through the Drive Conference in early May. The week after Drive we’ll reinstall our repaired monitor console in the East auditorium and spend a few days refitting our West FOH with the new console. As time permits leading up to the FOH install, we’ll be terminating and running any additional cables we need so that it’s as simple as plugging things in once the old gear is out. The convenient thing is that the snake cables for the Venue in west were run two and a half years ago when the Venue was installed in the East. We just need to terminate them, and we’re ready to go. For those of you wondering about tech specs, here’s what we have after all the shuffling between consoles. The West FOH rack features 4 Mix Engines along with the iOX expansion and an HDx card for interfacing with ProTools HD; this is identical to our existing console, and we’ll also be installing a ProTools HD system at FOH in the West. Both auditorium consoles feature the same complement of plugins whose highlights include Cranesong Phoenix, Serato Rane Dynamics, McDSP Channel G, and our new fave the SPL Transient Designer. On the stage side, we have 2 stage racks giving us a combined 80 analog mic pre’s, 16 digital inputs, 16 digital outputs, and 24 digital outputs. This puts us very close to our East console which is 8 less on the analog input side, but features an additional 8 analog outputs. Long term, I would like to upgrade both consoles so that their stage racks are identical along with adding a 5th mix engine to the FOH racks, but those can wait for future expansion in the next 2-5 years. The new console is a huge win for us in terms of how we operate, and we’re all very thankful that it is finally hear. The next few weeks are going to be pretty exciting so you’ll probably be hearing and seeing more as we move closer to the final install after Drive. I think I’m in the market for a good channel strip plug-in, primarily for vocal channels. I have the Eventide one that came as a part of the Anthology, but I’m not too crazy about it’s layout – a bit too clunky for my use. Right now I’m using the Digi 7-Band EQ, Digi Compressor, and sometimes the de-esser on vocals, but that eats up two or three plug-in spaces. I’ve been looking at Channel G but wondering what kind of DSP it requires? Any other ones you’ve checked out and liked? Since you’re buying Channel G for the new system, that means you like it. What are the primary applications for it in your mixes? I’ve been using Channel G on vocals for over 3 years now. It doesn’t get used on everybody, but I start everybody there. When that isn’t working, 9/10 times I use the built-in channel EQ. I never use the Digi EQ plugin on channels because it’s the same as the built-in EQ with an extra band. I know a bunch of guys who use it, but it always seemed like a waste of DSP to me. I typically have a lot of plugins going so I need all the DSP I can get, and using the 7-band would have killed me. 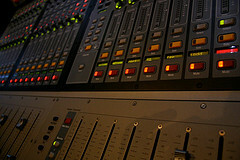 I have used the Digi EQ on groups, though, where there is no built-in EQ. I got addicted to the Digi on vocals at Easter because of the ability to change the slope of the high-pass and the extra band. Does the Channel G share plug-in resources or need its own chip? How many instances do you find you can use on a chip? Does it map well to the insert mode on the console encoders? I hate how the Digi EQ maps to the encoders. Putting the money channel EQs & compressors on plug-ins allows the ability to scope snapshot EQ/dynamics for everything else once in a while without effecting those channels. Worked pretty well for me this time around. I can see how the slope on the high-pass could come in handy. The snapshot thing makes sense, too, but I’ve been happy with what I can do with the Recall Safes for dealing with that sort of thing. Again I guess it just shows how cool the console is because you can do a lot of things a few different ways to find the one that fits your own workflow best. I believe Channel G uses its own chip, but I typically get all the vocals I need on one chip so I haven’t personally had any resource problems. BUT I generally don’t have more then 3 vocalists at a time. I’ve been happy with the way it maps to the console. The full version of Channel G has a 5 band EQ so the mid-band doesn’t map to the console which can be annoying at times. But I think they put out a Compact version of Channel G not too long ago that features only a 4 band EQ and a smaller DSP footprint. I think the Compact version is primarily aimed at Venue and ICON users to map to the surface. I’m starting to wonder if I shouldn’t have gotten the Compact version for the new console instead. The thing about Channel G is anytime I’ve tried some other things, I’ve typically always found myself going back to it. McDSP has a nice bundle going on right now, too where you can get 3 HD plugins for $995. I got in last month when they were still letting you put the full Channel G in the bundle so it was a great deal, but you can still put Channel G compact in. Try a demo of it, and if you’re looking at the bundle, I would also check out the ML4000; Briley raves about it all the time.